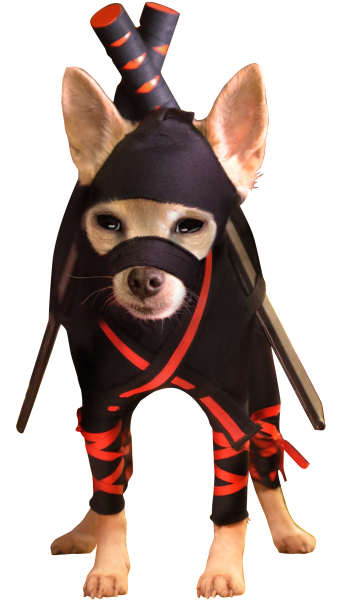 Realizing you have an inner Ninja! If I am being honest, I am quite a clutz, walking through a door way without slamming my shoulder into it the frame is usually a challenge for me on a good day! There is something to be said though for being accident prone, I find my reflexes are pretty awesome, I have made an art form of ricocheting. Today I was out walking one of my charges when two ladies with their dogs approached from the opposite direction, I strategically placed my friend to my side as we got closer. Despite my efforts to avoid a kerfuffle, the Bull Dog decided he wanted to rumble, he lunged and growled, which surprised my friend. The next thing I knew I was falling. As I was going down I somehow had the presence of mind to tuck my head and do a somersault? This isn’t to say it was a graceful gymnastic worthy display. I went down, did some kind of awkward roll and I was back up in an instance asserting that all was good and tried to hide my embarrassment. Way to go me, years of tripping and falling worked in my favour, it has made me rather stealth in the face of calamity. (If I am being honest I probably looked way more Carole Burnett than Ninja Warrior, I banged my head on the asphalt and my elbow got a right good smack along with my hip). The interesting thing, when we continued our walk, my canine friend kept looking up at me every few moments, and he licked my hand a few times. I think he felt bad…and yes I know, Caesar Milan would say we project human emotions on our pets, but I sincerely believe he felt awful. As he and I continued our trek home I found myself chuckling for a few moments…those ladies, what I sight I must have made… Never a dull moment in the world of dog walking!